Well, there’s no need to wait another minute because professional culinary help is as close as Canton’s Tuscan-inspired Gervasi Vineyard. 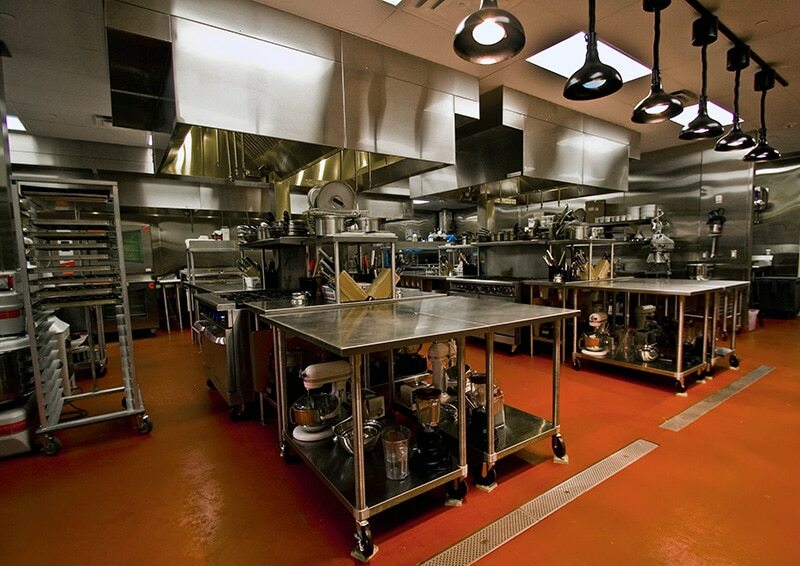 Housed in the elegant Villa Grande, The Cucina Culinary Education Center offers a wide range of culinary classes for individuals and groups where you’ll learn from top-notch professional chefs in a postcard-perfect setting. Soak up the passion and enjoy the pleasures of sharing great food with friends and family during hands-on, personalized instruction. Reserve your space in one of a dozen themed classes where you can learn to serve sumptuous sushi, create Korean cuisine, master Mexican meals and even learn to make the finest flatbread. If you’re a fan of the food served at The Crush House at Gervasi Vineyard, sign up and learn how to prepare some of the favorites from this popular contemporary eatery. There’s even a class for gluten-free dishes. The Gervasi Cucina (Italian for “kitchen”) is a fully stocked, spacious working kitchen surrounded by the vineyard’s luxurious villas. Whether you are a novice or a life-long gourmet, if you enjoy good food, good wine and good times, The Cucina is the perfect place to up your kitchen game. For a unique and memorable outing, Gervasi Vineyard will work closely with families, friends or businesses to help plan a custom culinary offering including both private culinary classes and cooking demonstrations. Imagine yourself in a kitchen full of loved ones or colleagues all working together to create a delicious meal in a fun and relaxing setting. Are you planning a friend’s wedding shower? Celebrating a special anniversary? Gervasi Vineyard can also help plan a cooking demonstration tailored to your event and needs. And finally, for the ultimate in luxury getaways, consider booking a class or two while staying at The Villas boutique inn, just across the courtyard from the Cucina. The Bistro was recognized by OpenTable as one of the 100 Most Scenic Restaurants in the U.S. The 2018 list showcases restaurants that offer breathtaking views of nature, cityscapes or landmarks. Honorees were selected based on an analysis of 12,000,000+ reviews of more than 28,000 restaurants across the country. The Bistro was one of just four venues in Ohio to make the list, along with The Twisted Olive, another GV Destination. Call us biased, but we think there are a whole lot of reasons for you to come and spend some time with us at Gervasi Vineyard. But let’s face it – few of those reasons would exist without one of the key attractions at Gervasi: wine. So whether you are new to the Gervasi Vineyard world or you’ve been here a dozen times, we’d like to show you how Gervasi’s head winemaker Andrew Codispoti and his winemaking staff turn grapes on the vine, our raisin d’etre, into delicious award winning wines during one of our many winery tours where wine novices and seasoned connoisseurs alike will learn first-hand about the Gervasi winemaking process. Free introductory winery tours are open to the public every Saturday afternoon at The Crush House, located just a short walk from the five acres of vineyards used to produce Gervasi’s Family Reserve wines. The half-hour tours of our state-of-the-art winery facilities are the perfect introduction to this thousands-year-old craft. For a more in-depth, intimate tour of the winery, consider one of Gervasi’s Pairing Tours also held Saturday afternoon at The Crush House. On these exclusive tours a Gervasi Wine Ambassador will give visitors a more in-depth, intimate tour of the winery and each tour concludes with a wine tasting especially paired with a selection of small bite appetizers. And finally, private in-depth winery tours are available during the week for groups of up to 30 people. No matter what tour you choose, be sure to take in the panoramic vista of the South Vineyard and surrounding landscape from the balcony of The Crush House. While you’re here, feel free to take a relaxing stroll around the grounds taking in the gorgeous scenery followed by lunch or dinner at Gervasi’s Italian Bistro, The Crush House or, during the summer months, The Piazza outdoor patio. Gervasi’s winemaking team takes great pride nurturing exceptional grapes at every step of the process as they strive to make our wines among the best in Ohio. All 21 wines produced at Gervasi are cellared and bottled on the premises. For a more casual experience, visit The Crush House Tasting Bar where you’ll find fifteen varietals of Gervasi wines are available for sampling. 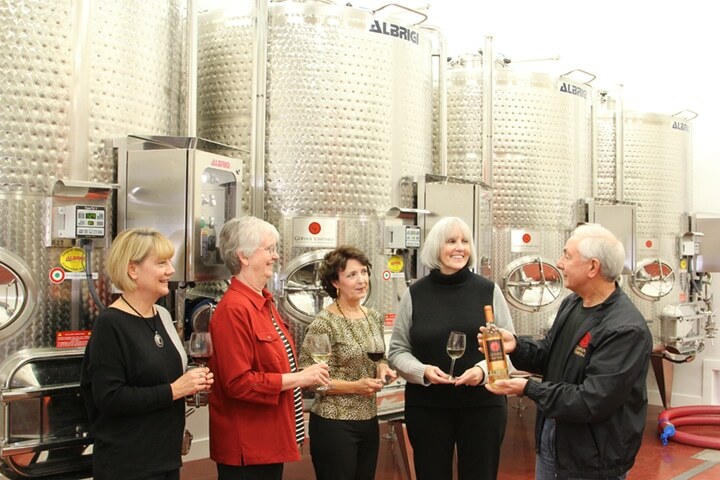 Click here for more information on all winery tours. Cruise in for fun at Gervasi! Even The Beach Boys would agree that Chevy “409” sitting there real cool like near Gervasi Lake is, well, fine. But wait; is that a ‘32 Coupe next to the Tuscan Pavilion? And over there, by the vineyard, that has to be the most perfect looking ‘62 Ferrari GTO you’ve ever seen. 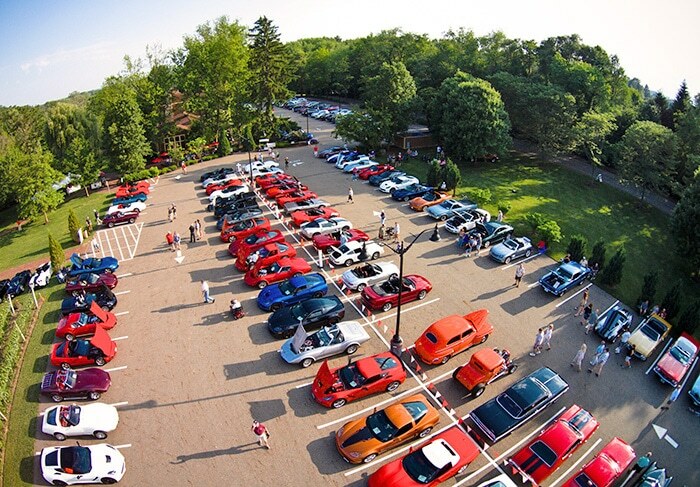 Classic car sightings like these and hundreds more are all possible this summer at Gervasi Vineyard’s ongoing weekly car Cruise-Ins held Wednesdays at the vineyard from 5-8pm through September. At what has to be the most amazingly picturesque place for a car show ever, these casual, fun, family friendly gatherings for car lovers of all ages are free and feature a wide range of cars and trucks from the very old to the not so old. Enjoy the best of both worlds as you wander between fenders while enjoying the surrounding beauty of the vineyard’s grounds and buildings. Each Cruise-In is sponsored by a different car club featuring American as well as foreign classic cars, but anyone is welcome to add their own classic car to the mix. Weekly door prizes and 50/50 raffles benefiting select charities are part of the mix every week along with food discounts for the first 100 car owners in the showcase lot. But, just a reminder – do not forget where you are! Yes, those cars are cherry, but just feet from a chrome fender or two is The Piazza patio, the perfect place for dinner and drinks after taking in the four-wheeled sights. The Piazza offers casual dining in wide open seating in full view of the vineyard’s spring-fed lake. Gervasi’s world-class red and white wines are available on the patio along with craft beers and the fan-favorite sangria. Bocce is played just feet from The Piazza so if you’ve ever wanted to try your hand at this European classic, here’s your chance. After dinner, throw a blanket on the lawn next to the lake and chill as the sun sets once again on Canton’s Italian-inspired oasis of charm, class, good eats and fine drinks. Additional information and guidelines for GV Cruise-Ins cruisers and visitors can be found here. For more details on The Piazza, click here. 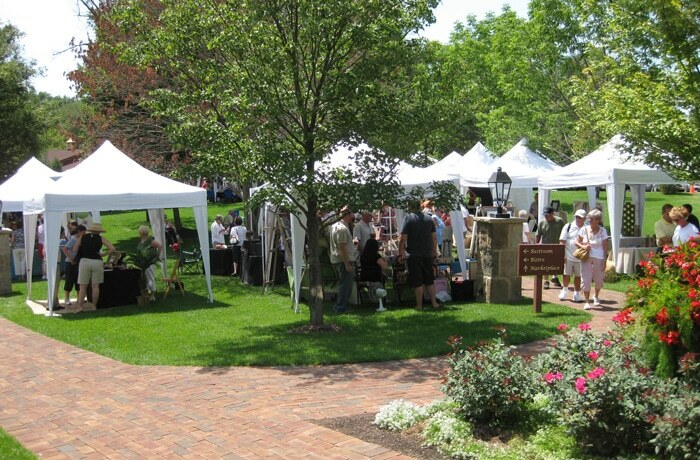 The vineyards and winding paths of The Gervasi Vineyard estate will once again provide the perfect backdrop Sunday as we host our annual Bellissimo Fine Arts and Fine Crafts Show in Canton July 22 from 12-5 pm. Take a casual summer stroll through our picturesque grounds next to our spring-fed lake where you’ll find on display the passion and product of over 60 artists and artisans in a wide range of mediums including ceramics, fiber, glass, jewelry, painting, photography, sculpture, wood and more. Free and open to the public, Sunday’s visual arts display is the perfect place to find that special gift for someone or to simply add a one-of-a-kind objet d’art to your own home. Food vendors will be on hand from The Crooked Kettle, Erin’s Chocolates and Pav’s Gelato along with Gervasi’s own food truck. Beer and Gervasi wines will be available at the expansive and inspiring Tuscan Pavilion. At The Villa Grande and on the adjacent Veranda you’ll be able to sample select Gervasi wines at our beer and wine flight bar. Canton singer/songwriter Scott Paris will be performing on the Veranda in the afternoon, while Beach Boyz Entertainment DJs will be spinning the tunes at The Crush House. If you’re new to Gervasi Vineyard, consider joining us on a vineyard and winery tour after you’ve taken in the art show. Tours run from 1-4:30 pm. Make a day of it and enjoy a meal at one of Gervasi Vineyard’s three distinct restaurants. Reservations are recommended for dining at The Bistro. Reserve a table online or by calling 330.497.1000, option 2 to speak with a host. The Crush House and The Piazza offer first come, first served, hosted seating with more casual dining options. We’d like to invite you to leave the world behind for a few hours Sunday and step into ours where wine lovers, diners, families, businesses, and tourists come to enjoy the pleasures of wine, food, atmosphere, tradition and service in a picturesque setting of relaxation and fun. Parking is free for Sunday’s show, located at 1700 55th St. NE in Canton. Event information including a list of 2018 vendors can be found on our website.